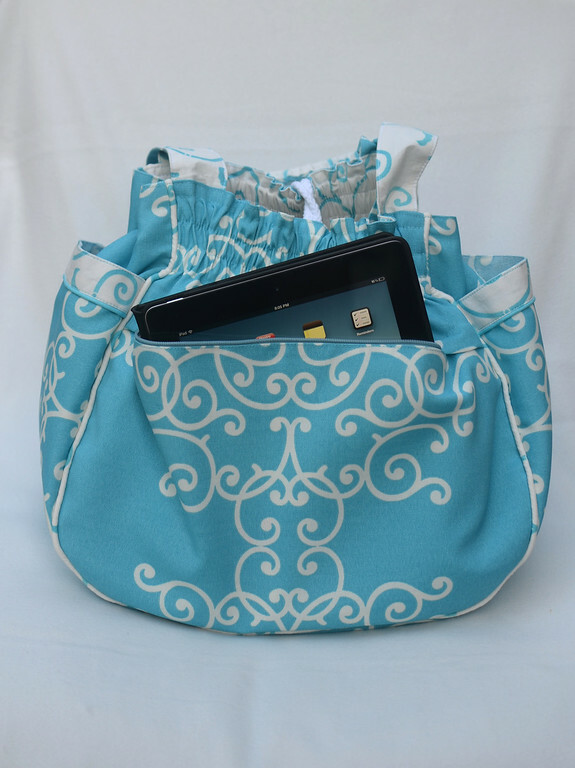 They're roomier than they look and are great for toting towels and things to the beach or pool. At least, that's what I'd use them for. And shopping. And, were I still a mother of very small children, a babyphernalia transportation receptacle. The straps are tubular in the middle so they feel comfortable on, and don't slide off, one's shoulder. I'll post more photos later when I'm ready to list them in the shop. Yes, you can buy all three of them, since I'm obviously not keeping them for myself. But for now, I'll just give you the quick tour. and one zippered welt pocket on the inside. This is the orange bag turned inside out. but only because I am fanatical about there being no raw or serged edges in my bags anywhere. You could, if you wanted, use it inside-out, but there's no piping on the inside, and the lining fabric is lining-ish, and the cute giant button is only on the outside. These were also unusual bags for me to make because they're very girly. And I'm not girly. For instance, they have elasticized gathers. And I'm not a gathers-person. But for some reason, these bags work and I really like them (or I wouldn't have made three, and in verrrrrrry expensive fabric, besides). I think sometimes one needs to take a huge leap out of one's comfort -or preference - zone and try something different, don't you? around the welt opening for the inside zipper. How then does it hold its shape? I think there's also going to be a sewing pattern for it. I took all the photos. 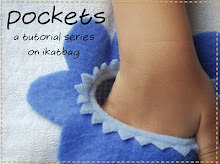 Do you want the sewing pattern? If so, hold me accountable, okay? Because heaven only knows I might procrastinate again and suddenly feel like making .... I dunno....wooden toys or.... a dress for a wedding. Now wouldn't that be ironic? yes yes yes to the pattern.... It is adorable! Also wanted to thank you for recommending the Sisters Grimm. I am have way through book 1... Love it. And yes, I would love the sewing pattern! These bags are awesome! 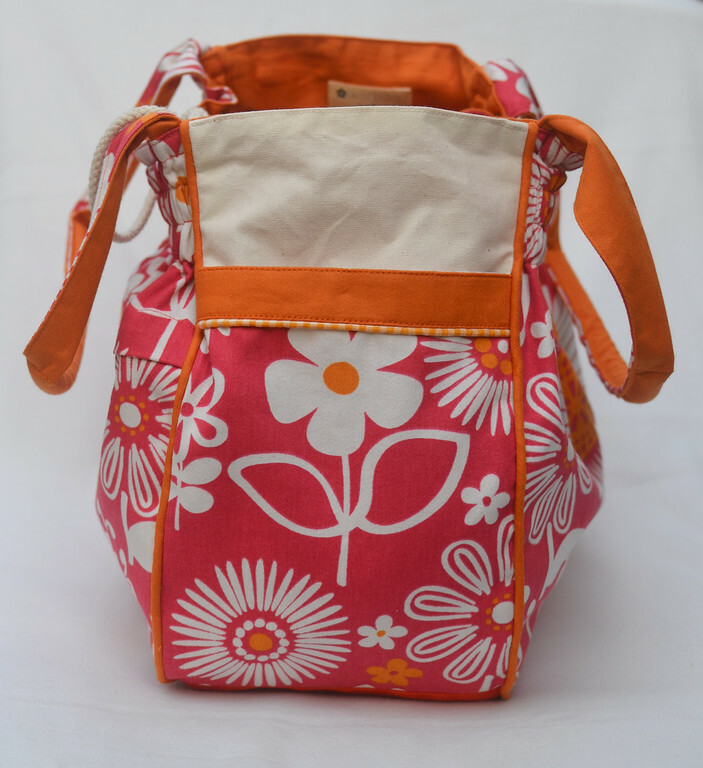 I love the shape and it has a different look from so many of the other fabric bags out there. I would love to have a pattern! Superb! What a great design .... and the elasticated sides are practical too ... very well thought out. PS The pattern would be great to have ... but think you need to think about dresses for the wedding first. Love the bag! Yes, I would be first in line to purchase a pattern for it! Love the new bags! If there is any, ANY chance you have time to put a few more of them together (yes, the dress comes first) I would love to see the bags in the Esty shop. 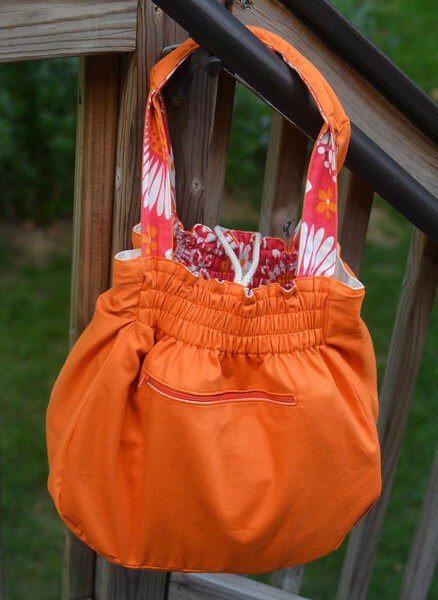 My bucket bag is making a great purse and would love a friend to be dragged around town with! Yes! Please do a pattern! Love the bags. Oooh, I love their shape and design! Do you sell the pattern? Yes, please do a pattern! I'm not into sewing bags much, but I would totally make this one, its awesome! Sarah - to answer your question: I don't need more bags in the house. I use my Reisenthel baskets (see this post http://www.ikatbag.com/2011/05/remaking-reisenthel_15.html) for everything, including toting swimming stuff to and from the pool. But I love making bags. So I have to put them up for adoption so they can go to better homes. I am GLAD they can go to better homes because if they stayed in mine, they'd just sit around the sewing room, going nowhere! I agree with Amanda. I think there will be a race to your Etsy shop when these appear later. Love them. I will be haunting your Etsy store accordingly. A pattern, please! As a mother of little ones who is always on the go, I would love to have this bag. Oh please do a pattern, I know it would sell so well. I have been totally chicken about doing elastic or any kind of shirring and this would totally motivate me. These are perfection! The blue one is magical! There are a lot of bag patterns out there... But I think yours is special enough to warrant a pattern. It's different and it has piping. I've only just begun to use piping (and I love bias tape too - that's actually my real crush.) I think you should go for it! 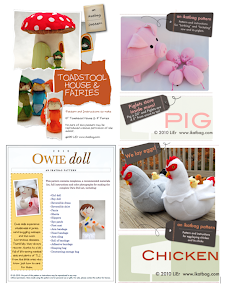 I'd love to review your pattern on my blog when you're finished. A pattern would be lovely! This bag looks just about doable to me (not so fiddly-difficult as some of the gorgeous things you make) and I might be able to figure it out on my own, but without instructions I'm sure there would be any number of mistakes and missteps along the way, and besides, I have yet to attempt doing anything at all with piping. Now there's some motivation for you...surely you want to indoctrinate more people into the wonders of piping! Pattern Pattern Pattern! Its absolutely gorgeous, and the blue one is my fav colour - I'd have fun trying to find something that looks as nice, and I love the little leave details on the last one and then the buttons and the piping... just all too much not to pattern-ised! Lovely bags. 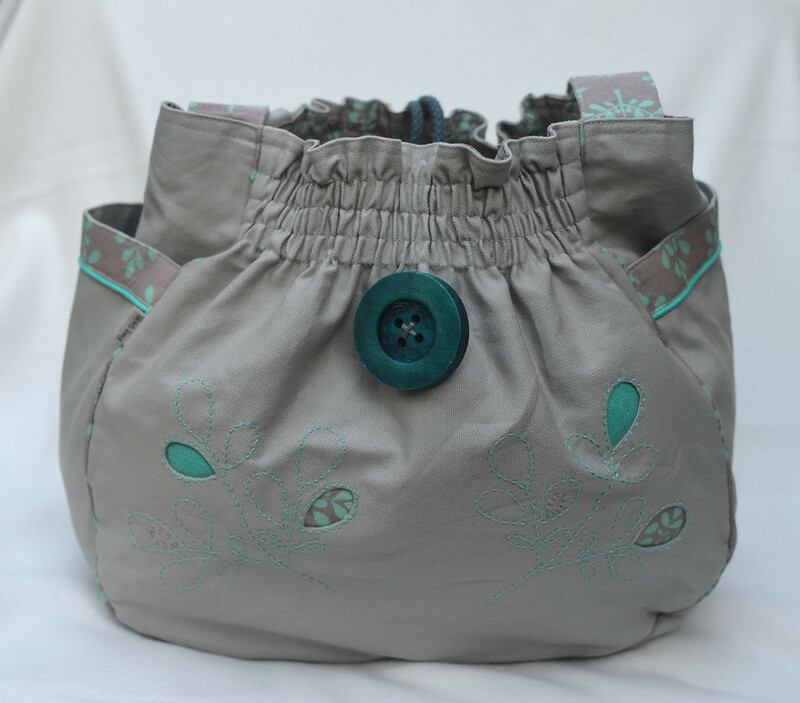 The reverse applique with the embroidery on the grey bag is my favorite. Definitely need the pattern, it's gorgeous! Love the first two bags! I would love a pattern so I could make these bags. I really need a bag with a separate pocket for my iPad. Right now I just shove it in my purse and I'm a little worried about scratching it up! Since I won't have the money to buy the incredible orange one real soon a pattern would definitely be on my list of needs. It would be perfect to go out and about with my darling danger. A place for her iPad, room for snacks and whatever other misc I might feel the need to tote.love it! 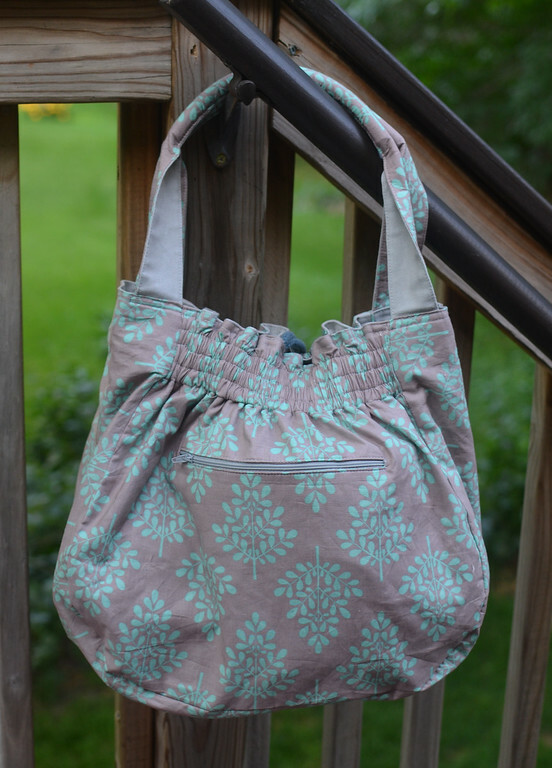 I love this bag and I'm already dreaming of fabric possibilities, so, yes, yes to a pattern!!! Would LOVE the pattern! FANTASTIC bags! I would buy the pattern for sure! Please create a pattern. I LOVE this bag! Um, Yes....Definitely need a pattern. Adorable Bag! When I saw the first photo, I said I must copy your design! So a pattern would be lovely!! I just finished a bag with piping, and am now addicted as well. Must make more piped bags. I love this bag!! Pattern, please! 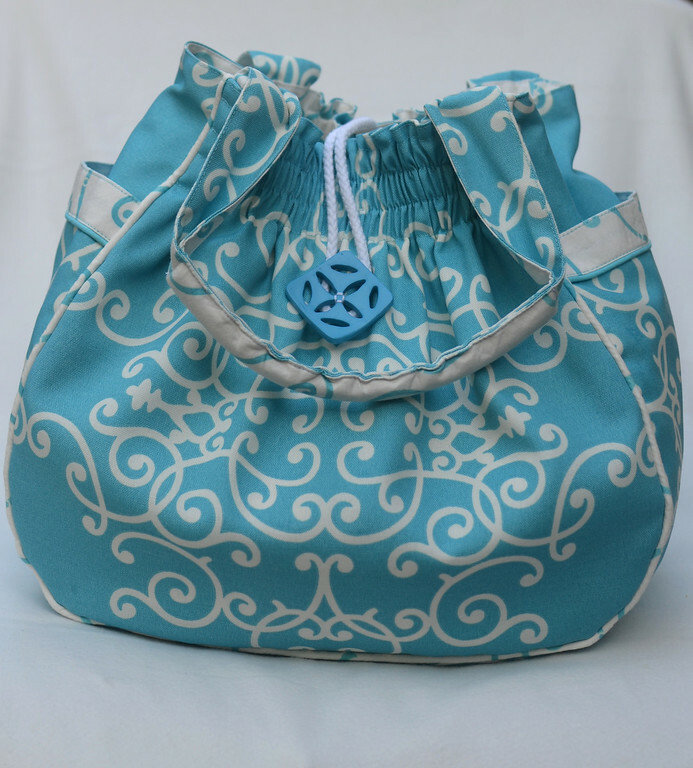 Love the Bags, YES want a pattern, I have read a few comments and seems like you have a winning pattern. Very Nice Bags, now you are held accountable, so you better go and make that dress lol. Wahoo about your 5yo readingand here humour. Love your Work. YES please do a pattern! LOVE LOVE LOVE your procrastination project! These are awesome! Love them! A pattern would be great - I'm expecting my first grandchild in Sept. and this would make a nice baby bag! Thanks for sharing the photos. These are lovely! Thanks for sharing the photos. A pattern would be great. 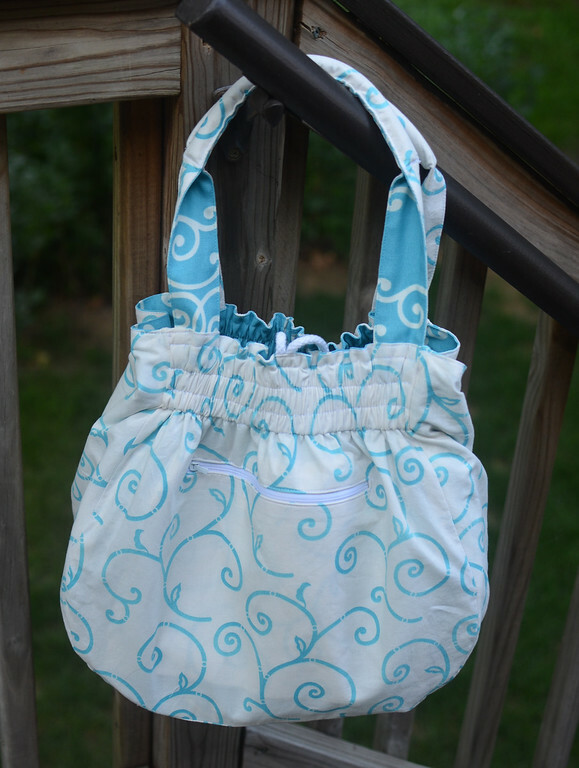 I'm expecting my first grandchild in Sept. and I would make one for my daughter to use as a diaper bag! Wow - that's a cute bag! And YES - a pattern would be great! It looks like a great size - not too huge. I would definitely buy a pattern. The bags are gorgeous!! I love the shape. I LOVE this bag! Pattern pretty please! My past! How sordid. If only it were that exciting a reason. No, forsooth -it was merely a bad front-hair day. Fortunately not also a bad back-hair day. Some days are both, and require extra chocolate. Yes, fans - don't be shocked. This old friend has license to say all sorts of things about me, on account of our somewhat colorful past ;) For revenge, I shall blog about him sometime soon. AND show you what he's sewn! Ha! Love the resurrection of 'forsooth'! Also, you might want to disabuse people of the 'colorful past' - I suspect it would put most people to sleep, really. And I realized I was rude: The bags are jaw-droppingly great. Count me in for the pattern! These bags are adorable! A pattern would be great. a pattern please! I would love to have the pattern. I wonder if it would be possible to make the inside water resistant. My daughter (4) is in a school where the teachers encourage the children to focus/be aware of nature. Every rock, leaf, dead ant, feather etc. are picked up, inspected and bagged to take to school for the daily show-and-tell. This bag would be perfect for all these "little treasures". I know you've already decided to do it (I read a few more recent posts), but I just wanted to reiterate what my lovely friends above have confirmed. WE WANT THE PATTERN! What a great bag! I can't wait to make it. I've been thinking about this bag ever since you first posted the pictures! amazing! I would love, love, love to buy the pattern. I've been thinking about these bags ever since you first posted the photos. I love your blog and have been following you for a couple of years(even though this is the first time I've commented...shame on me. I've just found your blog, and am LOVIN' these bags! Please, please, pretty please, make a pattern for us. PS I'm now off to become a follower, just so I can be sure not to miss that pattern when you let us have it. Judi: It's on its way! Love your bags. I would love a pattern. Yes! Definately! Please let us have this pattern! It's such an adorable bag.